Mosquitoes are one of the least appealing and most annoying insects on Earth. They can ruin anyone’s life. In addition, mosquitoes are rather dangerous. An experiment in the Canadian tundra showed that people with bare arms, legs and torso get about 9,000 young mosquitoes’ bites per minute. At this rate a person can lose half their blood in two hours. 10 Mosquito Behavior Facts: What Attracts Mosquitoes? Mosquitoes love moisture, heat, shade and thick forest. Only pregnant females prey on humans. How do mosquitoes find you? They can smell human body 50 meters away. CO2 which we exhale is the most appetizing and solid pointer. They are also attracted by our clothes and perfume: they’re drawn to people dressed in dark or bright clothes, who use sweet or flowery fragrances. Mosquitoes barely bite vegetarians and raw foodists, more often they go for those who are in love and exude estrogen and testosterone, for kids and pregnant women. People with a high concentration of steroids or cholesterol are also at risk. Mosquitoes are also attracted by the uric acid found in sweat; therefore working out near mosquitoes is not a good idea. You’re also at risk if there’s any water near your place. Mosquitoes lay eggs on the water surface, be it a small river, a pond or a lake. Such a “re-spawn” takes place regularly, as according to the Food and Environment Hygiene Department eggs develop within 2 or 3 days. It takes another week for larvae and pupa to grow then. The blood-thirsty females are especially active in the evenings and in summer. Some types’ activity peak is at night: from 11pm to 2 am. There are morning mosquitoes too, though. Mosquitoes can breed right at your house if there’s any stagnant water. Mosquitoes fly to their victim against the direction of the wind, and they fly back downwind. Mosquitoes detect a number of natural smells, such as essential clove, lemon, eucalyptus and basil oils, cedar oil and peppermint. Philariasis which causes lymph vessels clogging leads to limb swelling and sudden body temperature upsurge. Even if a particular mosquito doesn’t carry and deadly diseases, its bite still isn’t any good for you, as there will be blisters, reddened skin, itch, and pain… And what about those who are allergic to mosquito bites? They know for sure that a single bite can cause eczema or even suffocation. Fortunately, a dozen of methods of getting rid of mosquitoes have been invented. Each of these methods, though, usually suits a specific situation, so in order to choose the most effective way of getting rid of mosquitoes you should know the peculiarities of their behavior and hunting habits. Dark spots that appear like bruises. 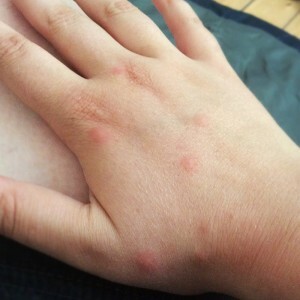 One of the commonest mosquito bite allergy reactions is the development of a puffy white bump on the skin. Mosquito bites on babies are easily noticed because of the softness of their skins, these bites are characterized by red spots , and blisters that may become sore. Most babies who suffer from mosquito bite allergy will cry continuously or may become very irritated. Most babies will suffer from low grade fever few hours after mosquito bites while most adults may suffer from the same symptoms within 24 and 48 hours after mosquito bites. One of the facts about mosquito bites is that, your immune system will naturally react to the presence of parasites introduced into your body, therefore mosquito bites don’t kill immediately. 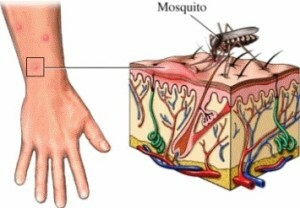 How to deal with mosquito bite symptoms? Itchy mosquito bites can be treated immediately with a topical anti-itch lotion, this can also help in reducing itchiness, swelling and redness of the affected area. Other mosquito bite allergy and symptoms such as fever, body aches, rash fatigue, light sensitivity, meningitis, confusion and neurological changes will require anti-parasite medications or oral histamines. A cold pack of ice cubes can be used to reduce the severity of mosquito bites on babies. For hives, you can simply take a cool bath without the use of soap or simply place ice cube patches on affected area for about 12 minutes. You don’t have to take any medication until you start noticing mosquito bite symptoms. Taking medications unnecessarily may lead to a depletion of your body’s probiotics and your immune system becomes weakened. The use of mosquito repellent and proper cleaning of surrounding areas around your home are the best possible ways of preventing mosquito bites on babies and adults. One of the facts about mosquito bites is that not every victim suffer from symptoms or allergies immediately.